kc dyer started her writing career publishing Young Adult novels. But it is her adult Romance, Finding Fraser, that hit pay dirt. Literally. And for good reason. Emma Sheridan is every woman: courageous, independent, brave, impossibly insecure, cautious, loyal, impulsive, hopelessly romantic, and…single. Definitely still single, because the only man she’s found that ticks all her boxes is Jamie Fraser, and he’s taken (and fictional, but who’s counting? ), as all the good ones are, right? 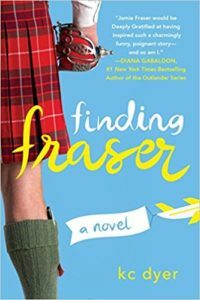 So, staring down her thirtieth birthday and determined not to spend the latter half of her life alone, she does what any normal, sane, and completely crazy woman would do to find the man of her dreams—she quits her day job and flies to Scotland in search of her very own, real live, Jamie Fraser. Oh, and she blogs about it. This is the first Outlander spin-off fiction I’ve read that is fresh, real, and unique. kc did not attempt to recreate Diana Gabaldon’s timeless love story; she simply used it as a jumping off point to create a delightful, wacky, and at times throat-achingly beautiful story that will echo in the bones of every woman who’s ever wondered if she would—or will—find Mr. Right. Intelligently written and evocative, Finding Fraser frolics through modern Scotland on an age-old quest: the search for enduring love. It definitely ticked all my boxes! 5-Stars! **I received this story as an ARC**. My review is an honest reflection of my impression of the story, not my acquaintance with the author.